#FindCarolineMwatha -- the hashtag had been trending in Kenyan social media circles since the end of last week. Even the officially appointed Independent Policing Oversight Authority (IPOA), in charge of monitoring Kenya's police service, retweeted the message. 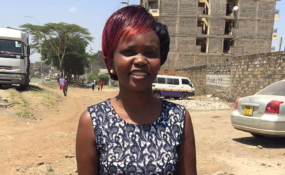 On Tuesday evening, police confirmed the death of Caroline Mwatha. On February 6, the police report said, Mwatha had visited an abortion clinic: "Investigators believe that Caroline died in the clinic and [that her] body was transferred to the Nairobi City Mortuary on February 7." But not everyone believes the police's version of events, and as a local rights campaigner, Mwatha's disappearance immediately rang alarm bells in human rights circles. "Since Caroline Mwatha disappeared we have essentially been pushing for the investigation to find out about her whereabouts," Irungu Houghton, executive director of the Kenyan branch of Amnesty International, told DW. In Dandora, a low-income neighborhood of Nairobi, Mwatha was a caseworker with the Dandora Social Justice group. "She did a lot of work to document cases of human rights abuses. Many of those cases were related to police brutality or extrajudicial killings," Houghton said. "Her work put her in a very risky position, so we had additional alarm over the news that she had disappeared." Mwatha's father, Stanslus Mbai, told DW he was shocked that the police report alleged that his daughter had died in an abortion clinic. "That was another torture," he said. "What brought the death of Caroline, I cannot tell you until the truth is discovered. "Caroline told us: 'The kind of work I'm doing is very sensitive, so I request you, never tell anybody about the work,'" her father said, adding that Mwatha knew her work put her in danger. Police have arrested six people they believe were involved in the failed illegal abortion that authorities maintain led to Mwatha's death. But her family and the rights groups have demanded autopsies by both government and human rights pathologists. "The government promised to do the postmortem. Unfortunately, this morning we heard that this was going to be postponed," Houghton said. "As a result of direct conversations with the Ministry of the Interior, they have agreed to do it on Thursday." While Mwatha's relatives and colleagues wait for more clarity on the matter, the mistrust in the authorities highlights the broader issue of police violence and killings in Kenya. "Missing voices,"a website by the Police Reform Working Group, a group made up of both local and international rights organizations, documents the disappearance and extrajudicial killing of people across Kenya. In 2017, they recorded 115 cases. Youth in Nairobi's low-income areas like Dandora are especially affected. Both the rights groups and the authorities have in recent years made efforts to cooperate, setting up community meetings with police representatives and IPOA, a watchdog that is charged with investigating possible cases of police violence. In early January, police and community members met to discuss the death of Carilton Maina, a 23-year-old studying in the UK who was shot by police in the neighborhood of Kibera during his Christmas break. The case is currently being investigated by IPOA. Mwatha's fellow grassroots human rights campaigners have a similar distrust of the authorities. "I received threats. I had to go into hiding. I went upcountry for two months," Kennedy Chindi from the Mathare Social Justice Centre told DW. "I'm still not on good terms with the police. I still fear them, and I don't trust them." His colleague Gacheke Gachihi said he was appalled by the delay at the city mortuary. "You can't come here and bring bodies without producing an ID," he said. "These people were able to bring the body here and they are nowhere to be traced. It took almost six days for them to tell us what happened to Caroline." "We suspend our judgment until the postmortem has been done," Houghton said.